An adult female mallard duck, Anas platyrhynchus, with three immatures. Mother duck is at the top of the photo. Click to enlarge. I was walking in Brooklyn Bridge Park last week, descending the north-most path in the water gardens. I heard plop plop. Two ducks had slipped from the little bridge into the water. They were two of three almost fully-grown immature mallard ducks with an adult female. 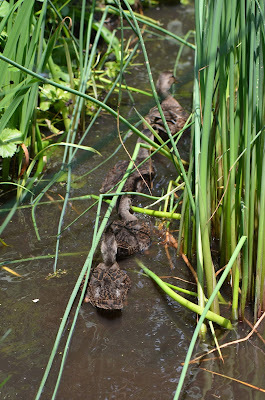 They all looked at me for a moment, then the mother turned and led the way into the reeds. They paddled into the thick high foliage at the southern end of the little pond by the wine bar and disappeared. I barely had time to take these photos. I went to the other end of that patch of plants, thinking the ducks might come out, but no. They had quietly slipped into a spot where they could not be seen. There in the middle of metropolis, with hundreds of walkers, joggers, and bikers passing every day, the ducks have a secret spot. I wonder if they've been there since February and March when I saw ducks mating on the pond? Mallard duck eggs take about a month to hatch. The chicks stay with their mother for about eight weeks until they are able to fly, or fledge. 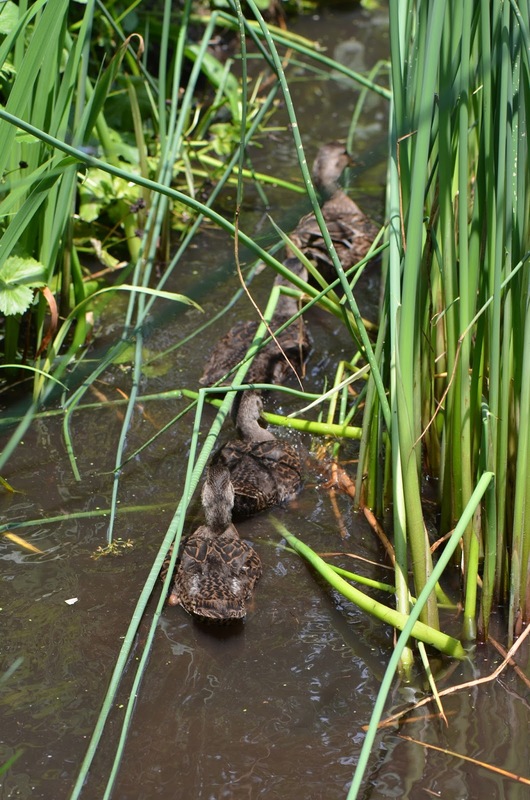 So, yes, one of the ducks I saw mating at the end of winter may have built a nest deep in the reeds, laid eggs, hatched chicks, and discretely mothered her flock in the area all that time, eluding me on my frequent prying walks in the park.